Export of Server configuration is performed in the Configuration > Export section. You can choose which items will be exported (see Figure 23.1). 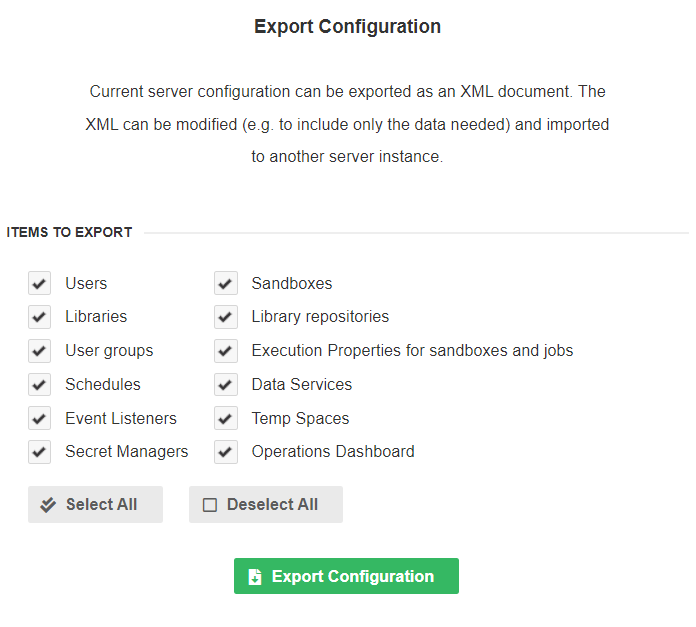 Click the Export Configuration button to save an XML file with the configuration. The name of the XML file includes current timestamp. If you manually edit the file, make sure that the content is valid. This can be done by validation against XSD schema. The schema for a configuration XML document can be found at http://[host]:[port]/[contextPath]/schemas/clover-server-config.xsd. The XML file contains selected items of the CloverDX Server instance. The file can by modified before importing to another Server instance - for example to import schedules only. If you want to automate the process of configuration export, use the HTTP API Operation export_server_config.